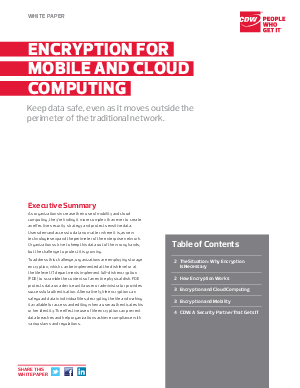 As organizations increase their use of mobility and cloud computing, they’re finding it more complex than ever to create an effective security strategy and protect sensitive data. Users demand access to data no matter where it is, as new technologies expand the perimeter of the enterprise network. Organizations strive to keep this data out of the wrong hands, but the challenge to protect it is growing. or her identity. The effective use of file encryption can prevent data breaches and help organizations achieve compliance with various laws and regulations.